If you are using the latest version of WPUF, then you don't have to go through all the coding outlined below in this document. The latest version of WPUF has a built-in feature for uploading WooCommerce product image gallery. Your users can now easily select to upload multiple images for their products from the frontend! Check this link on how you can Add a WooCommerce product image gallery using WPUF! 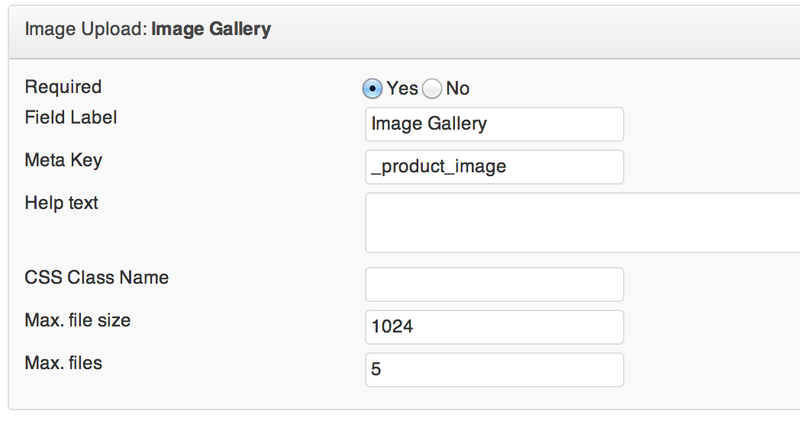 To solve this issue, we'll be adding a image upload field in the form editor with a different name (that woocommerce doesn't uses). Here we are using _product_image meta key to store the image for product gallery. The trick is, we'll save the image IDs to the WooCommerce's _product_image_gallery meta key when we hit submit/update button in our form. Paste the code in your themes functions.php and your product gallery will be showing perfectly.